I am sorry to inform you of the death of a former pupil of Brigg Girls High School. Janet Cossins (nee Hardaker) pupil at Brigg Girls' High until 1978. Janet died on 31 March 2008 at the age of 48 following a very long illness, bravely fought with lots of courage. She died at her home in Phoenix, Arizona. She is survived by her husband John, her parents and her sister Julia. Remembered with great affection by her many friends in the UK and USA. Former members of Brigg Grammar School, Brigg Girls High School and Sir John Nelthorpe School met at Elsham Golf Club for their Annual Dinner with Guest Speaker, John Allcock. Eighty members of the Association, ranging in seniority from George Gurnell, 87, who attended between 1932 and 1938 through to those who are currently in the Brigg Sixth Form, attended the dinner. There was a very strong contingent from the 1960s and several members had made considerable efforts to return. Neville Miller flew in through blizzards and snow drifts from the frozen wastes of the Arctic where he had been installing satellite equipment in temperatures of minus 40 degrees and others came from Spain, America and Croatia. John Allcock (1958-1965) who teaches at Sir John Nelthorpe School spoke of his experiences as a Grammar School pupil travelling into Brigg by bus six days a week as that included Saturday Morning School in the 1960s. He reminded his contemporaries of the instruction by prefects as the bus crossed the bridge into Brigg ~ ‘caps on’ and of the cottage industry that took full advantage of the various skills collected together on one bus enabling homework to be completed during the journey. He spoke warmly about the various characters amongst his contemporaries, many of them gathered at nearby tables to hear his recollections. Football, cricket, swimming and athletics were high on the list of priorities and each held an amusing story or anecdote. However, he reflected that through lack of LEA investment the sports facilities have not been improved in 50 years and schools in Scunthorpe are demolishing facilities far better than those still in use at one of the leading schools in North Lincolnshire. His address was packed full of humour and everyone thoroughly enjoyed the occasion with a rare standing ovation when he sat down. Headteacher, Linda Hewlett-Parker praised the performance of the present students and detailed their success in the summer examinations 2007 where they were top of the North Lincolnshire league tables for subjects including Maths and English. Chairman, Jane Gibbons, thanked those who had worked so hard for the association during the past year and congratulated those who had gathered from many quarters of the globe to reunite with their old class mates and enjoy the opportunity to catch up on the life and achievements of their friends. Next year the Dinner will be held on 21st March 2009 at Elsham Golf Club. Vernon Atkin has died aged 86. Vernon was born at Heath in Derbyshire on 11th April 1921 where he attended local schools. During the war Vernon served in Burma and was given the task of interpreting Japanese messages ~ so he became fluent in Japanese and he also spoke excellent French. In 1943 he met Min and they married in the September of that year. Vernon’s love of languages led him into education and eventually he succeeded ‘Chips' Morris as Head of Department at Brigg Grammar School and then Sir John Nelthorpe School from where he retired from teaching in 1982. After Min’s death he was remarried to Mary in 1962 and they enjoyed dancing, gardening and caravanning. They organised adventure holidays in the lakes and many educational trips together to Paris with the school. Vernon was a keen walker and also taught hockey in the school during games sessions and again voluntarily on a Wednesday afternoon at a time when this were reserved for sports training and school lessons took place on Saturday mornings. Vernon was a keen sportsman playing golf at Elsham and hockey with Brigg as a driving centre-half, inspiring many hopefuls onto greater things. He enjoyed a cigarette and a glass of Brandy or two! One of the great loves and successes of Vernon’s life was his involvement in the Lions in which he identified and helped so many in need. 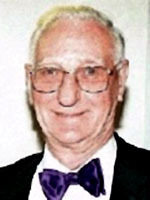 A founder member, Vernon Atkin filled every senior position in the Brigg club, including president, secretary and treasurer. He was honoured for his contributions and service by receiving the International Leadership Medal for his work for Brigg District Lions over more than 30 years. To a standing ovation from delegates at the Lions District Convention in Nottingham, he collected the medal from international director Philippe Gerandal, of Belgium.